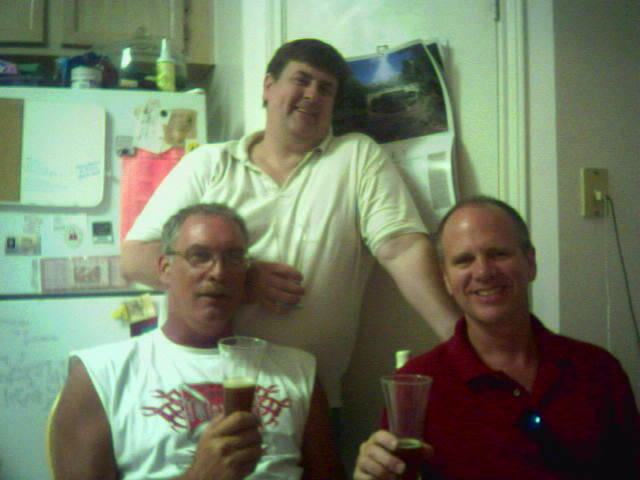 Robert, Doug and Mark enjoy the fruits of thier labor. Is that a didjeridu in your pocket, or are you just happy to see me? who go there, not exactly the kind of folks you want to see naked. After that email, I started thinking about Hippie Hollow; since it is a county park and charges admission now (sort of like how you have to pay to see a peep show), I figured there would be a site I could link to. However, the site I found had more than just photos of the beach. It had photos of the visitors in all their natural wonder. Of course, there were very few of the folks who you wanted to see naked. I really could have done without seeing grandma and grandpa in all their glory. A lady walks into a bar with a parrot ... This might sound like a start of a joke, but it's just a typical Saturday night in south Austin. Now the difference between Austin and south Austin is that south of the river they take the "Keep Austin Weird" mantra to the extreme, and while it can shock those of us from the northern, whitebread suburbs, most Austinites just smile knowingly, wishing they could be that hip. Saturday night Doug and I made one of our rare trips to Oakhill, an area in southwest Austin. 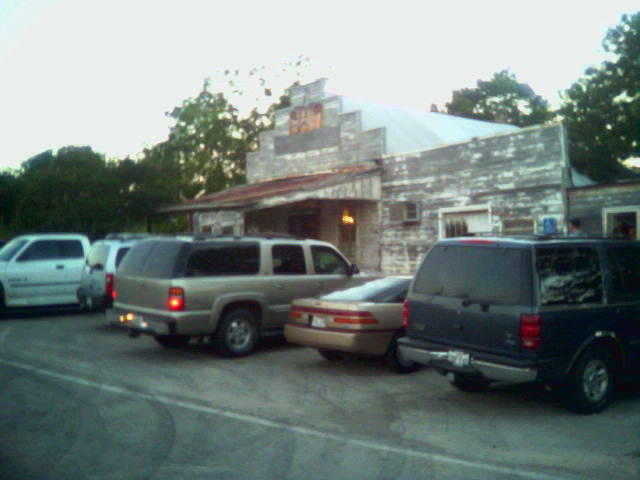 It's a 45 minute drive without traffic, but a friend talked us into heading out to the Y Bar & Grill to see one of Austin's favorite musicians, Lisa Tingle. The first thing I noticed about the Y Bar was that it was slightly more upscale than one would think in Oakhill. I mentally pictured something completely casual, shorts and flipflops, the standard south Austin dress. Instead it was slightly dressy, with nice sundresses and sandals (that's as dressy as summer gets in Austin). Lisa played at the outside bar which was a nice covered patio with ceiling fans so that you don't feel the 95 degree at 8 p.m. heat. There were three big screen televisions that were showing the Longhorn baseball game (they were playing in the College World Series). I'm not sure if the TV's are usually there or if they had to bring them in special so the guys would be willing to take their wives out to dinner. Because it was hot and we weren't that hungry, we opted to do appetizers and wine instead of a meal. Everything was just laid back and easy, Austin style. As we were sitting there, enjoying ourselves, a couple walks in and the lady had a parrot on her shoulder. Since the tables were all taken, she and her husband/boyfriend/whatever sat at the bar and ordered a few drinks. I swear, I think I was the only person who gave her a second look. I guess maybe it's quite common in south Austin to take your pet parrot out for a drink. The only time the parrot left the lady's shoulder was when the lady went inside to little girl's room; at that point the parrot hopped on the shoulder of the male companion, but went back to the lady when she returned. The couple stayed for about a hour and left -- I guess the baseball game was over and the crowd was thinning. Maybe it was the parrot's bedtime. I think the strangest thing was that no one thought the parrot thing was strange. That's what makes south Austin what it is. Friday was take your dog to work day, but I didn't get the memo, so Dante & Allegra stayed home. 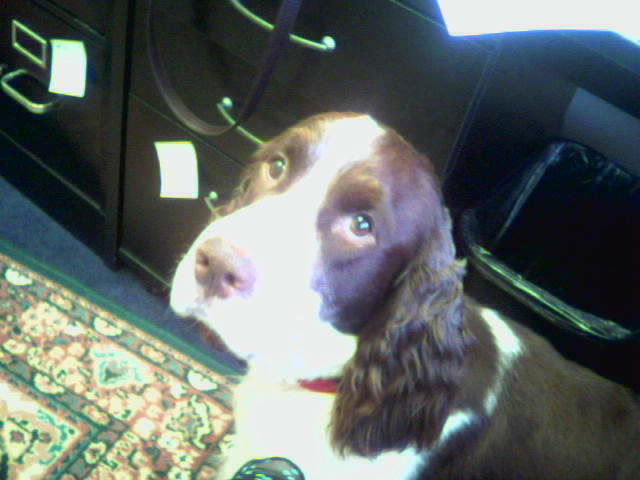 However, one of my co-workers brought thier dog, Spencer, for part of the day. 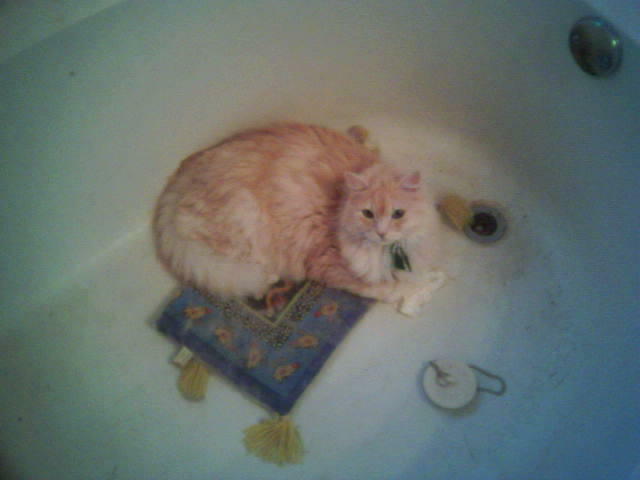 not sure why, but Dexter decided to nap in the tub this morning. Weird cat. If you've noticed, my past few posts have been a bit different. They have been a bit shorter and the photos weren't as good. 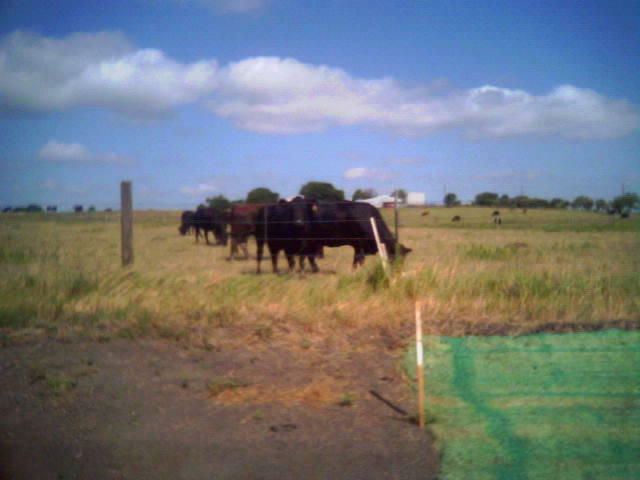 They have also had issues with capitalization and in the case of the cows entry, boring. This is because I've been experimenting with mobile blogging or moblogging. This is where you can post photos and/or text to blogs via your cellphone. As long as you have a cellphone, you no longer need a computer to blog. My opinion on moblogging is mixed. I like the idea of being out and if there is a photo or something you want to post, you can do it. However, I much prefer a keyboard to a keypad. It's easier to type a message than it is to text a message. As to the photos from my camera phone, they leave a lot to be desired. Still, I felt that in studying blogs, I need to experience moblogging. Supposedly the next advance in blogging is video blogging, or vlogging, but Blogger doesn't provide that yet. there has been some buzz lately about a book new restaurant in south austin called freddie's place. We met friends there for lunch and it is a cool place to hang. We sat outside under these huge trees, talking, watching some guys pitch washers and listening to a band. 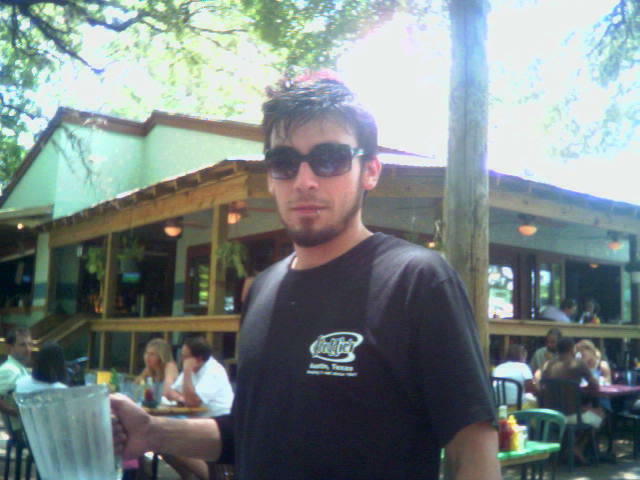 The waiters are even austin cool. Ours had a hot pink stripe in his hair and numerous facial piercings. One of our favorite weekend things is a drive through the country. Of course the dogs have to go. Dante sleeps, but allegra keeps a close watch in case she spots a wayward cow. Tonight we went to eat barbecue with a bunch of folks at cele. It is in the middle of nowhere and only open one night a week. The movie second hand lions shot a scene here. 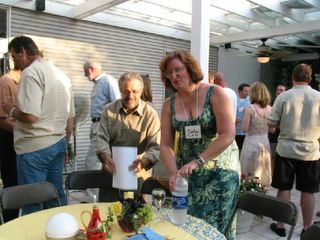 Last night was the June wine tasting for the Women of Wine and the Men Who Adore Them. It was a tour Italy to mark Paula's recent trip to the country. Despite it being hot, yesterday's high was in the 90s, everyone had a good time. Doug and I left a little after 1 a.m. and there were still folks there. This morning we slept until 10 -- I can't remember the last time I slept that late. But it wasn't just because we were out late. About 3:15 this morning, Allegra decided she had to sleep on the bed, between our heads, and wouldn't get down. We noticed she was shaking like she does when fireworks are shot off in our neighborhood. We couldn't figure out what she was scared of, so we let her stay. Normally she crawls under the bed when she's scared, but yesterday we decided we needed that space for storage more than they need it to hide their "treasures" (our stuff that they steal and chew up). I guess with her hiding place blocked, she figured the next best place was between mommy's and daddy's heads. I just hope this doesn't become a nightly occurrence. I can't sleep until 10 every morning. I'm driving home from work, thinking about nothing really, but going over my grocery list in my mind. I look up and parked on a side street is a pickup truck with someone in a big brown dog suit is in the back. "Is that Scooby Doo?" I wonder. Scoob is waving so I wave back. As I pass, I remember I have a camera phone now and think about turning around and taking a photo, but decide against it and keep driving. A block or two later I see the Mystery Machine, the van that Scooby's pals drove on the show. It's parked at a gas station and looks empty. Now I've seen this van around town before, but given the Scooby sighting, I find this curious. This time I turn around and snapped this photo. 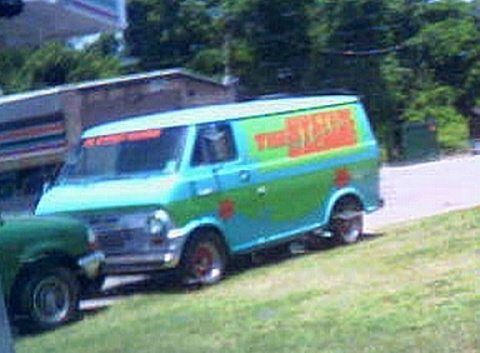 I continue back up the road in hoping to find Scooby to take his picture, but by now Scoob and the pickup are gone. As I turn back around, heading home, I realize that in Austin the only thing strange about this incident is that Shaggy was no where to be found. I know it has taken a week, but I finally got our photos on KodakGallery.com (formerly Ofoto). This is just a fraction of the pics we took. You should be able to access them by clicking here. 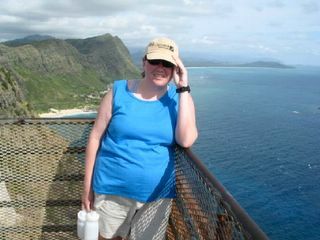 Anyway, it is a really beautiful place, but I still think I liked the Pali Lookout better. However the Pali was even more windy and difficult to get a good photo. I found out Thursday that I won't be teaching this summer -- there were only 5 students who registered for the class. Guess no one wanted to take a 3 hour class three nights a week. Originally I had been signed up to take a grad-level multimedia class but dropped it when they asked me to teach. I thought about signing up for it again when my class was cancelled (especially as several of my school friends are taking it), but decided not to. Instead I will focus on my thesis, writing the proposal and starting research, and reworking a couple of my papers to submit for some conferences. At Blanc & Otus, Sarah is going to be induced on Thursday. For the time being, it shouldn't impact the number of hours I work. However, some things are in the pipeline and if they happen, I might get more hours. I'm not too worried about it -- such is a life of a contractor. And for the agency, it has to be tough too. It's hard for them to know when to hire a permanent staff or not. Also, because I already have teaching commitments in the fall, it's more difficult for them to introduce me to a client when I will be leaving the account in a couple of months. There is one account I've been working on that the client doesn't even know I exist. But still, I was able to kick tail and get them some good analyst briefings. The key, I think, is to remain flexible. Three months ago, I was just going to take one class this summer -- negotiation. Then I was going to work part-time and take multimedia design (because it was at night, while negotiation was during the day and really intensive). Then I was going to work and teach, and with working it looked like it might be close to full-time. Now it's just work. I think the fluidity might drive other folks crazy, but after the last few years, I'm just happy to have the options.